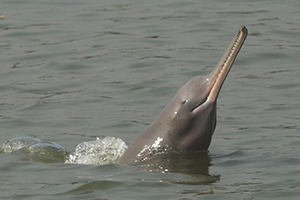 A Ganges river dolphin: image credit: Mansur/WCS BangladeshA new study (7th of May) reveals a method to improve the monitoring of the endangered Ganges river dolphin – one of only four remaining freshwater cetaceans since the Yangtze River dolphin became extinct in 2007. The ability to detect changes in population size of a species helps to inform conservationists how fast a population is declining, and whether a conservation action has been effective in stopping a decline. A Ganges River Dolphin: image credit: Mansur/WCS BangladeshPreviously it was believed that visual survey methods - reliant on conservationists spotting and recording surfacing dolphins - were the most cost-effective way of surveying the species. The study revealed that detecting the sound that dolphins emit using a method called a combined visual-acoustic survey, can improve the ability to detect population trends and relatively quickly become the cheapest method for surveying. 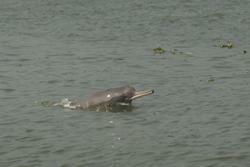 The study was undertaken by scientists from the Zoological Society of London (ZSL), Bangor University, the University of Chittagong in Bangladesh, the Wildlife Conservation Society (WCS), the Bangladesh Cetacean Diversity Project, and the Fisheries Research Agency of Japan recently in South Asian River dolphins in the rivers of Southern Bangladesh. Nadia added: "I chose to come and study in the School of Environment, Natural Resources and Geography at Bangor University given its reputation as an interdisciplinary research centre. Over the last three years I have met a diverse range of researchers with a broad range of expertise which has meant that I am never short of advice when needed." These findings have been published (7th of May) in the journal PLOS ONE.